In these times, nobody uses a fountain pen unless it is a hobby or has some kind of a sentimental value attached to it. Either way, utmost care must be taken to preserve it. 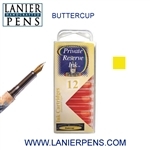 The right fountain pen inks should be used at all times in order to avoid clogging of the pen’s narrow passages. Inks with shellac should be avoided. They should, ideally, be free from sediments, and be non corrosive and free flowing at all times. Woods N’ Dreams have exactly the right kind of fountain pen inks that you are looking for. We are very proud of our fountain pen inks, as we know that it is of the best quality. The ink comes in a handy 1.69 fl. Oz. or 50ml attractive bottle. It is Neutral Ph and ensures a smooth flow and excellent coverage. It comes equipped with a fast-drying and non-clogging technology which saves you a lot of time. They are available in shades of Velvet Black, Sherwood Green, Fiesta Red, Naples Blue, Tanzanite and Chocolat. 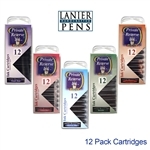 Our regular fountain pen inks ensure fast drying, but if you are one of those people who dislike waiting, then you also have the option of buying our fast-dry formulation inks. 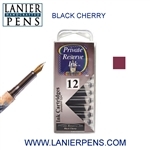 These inks are ultra-fast drying and what is more, they are perfect for writers who are left-handed. They come in shades of Ultra Black, Midnight Blues, Sherwood Green, Chocolat, Tanzanite and American Blue. The only downslide to using fountain pens is the clogging of the ink within the pens passages. With our fountain pen inks you can be assured of continuous hassle-free writing with your beloved fountain pens.